A group study reservation tablet. Group study rooms in the Sherrod library are made available via an online reservation system requiring an etsu.edu email address. Rooms may be reserved only by current ETSU students. 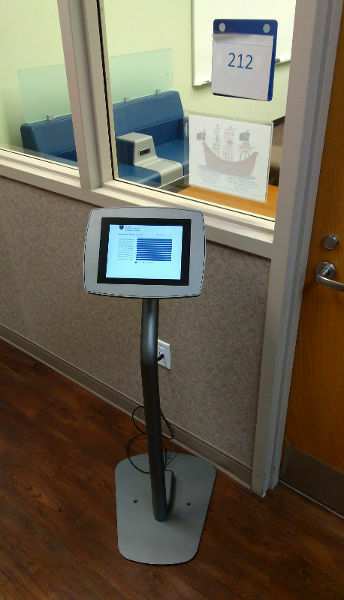 Reservations may be made and viewed online, or in person using a tablet interface in the first floor lobby, and directly next to each group of adjacent group study rooms. Each group study participant may reserve up to 3 hours per day across all group study rooms. Rooms may be reserved up to 7 days in advance. Groups who do not use all of their allotted time are encouraged to cancel unused blocks of time using a link provided in the confirmation email they will receive after a successful reservation. This is a self-service system and groups may be asked to leave by other groups if they have not reserved the room they are using. Groups of two or more people are given priority over single individuals making use of a group study room, regardless of whether or not the single individual has reserved the room. Individual study rooms exist for single individuals looking for a private study space. Technical issues may be reported to libsupport@etsu.edu and will typically be addressed within 24 hours.